This French boat is the epitome of a racing boat with a rich history behind it. The FD is a Kevlar carbon fiberglass composite boat with a recent addition of the double hull and bulkhead. F-170 1976 Lanaverre – “Repechage”: the first carbon Kevlar fiber FD boat ever built. One of two FD's built by Lanaverre for the French Olympic team. There is lots of history behind this boat. It was sailed by the Pajot brothers competing for the 1976 Olympics. Much has been rebuilt over the years: full double bottom, G10 strengthened mast plate, Lindsay deck (closed cell) and bulkhead (to current standards), all new rigging with a newer Proctor E mast. It looks like any new and modern boat. New fiberglass deck added with a contemporary honeycomb core foundation added in 2004. It appears to be a very stiff boat. Set up for large spinnaker/pole, jib cars, most adjustments to stay current and should be able to do well in heavy air. It is the basis of the modern Mader hull shape. The speed potential has not been fully tapped/measured on this boat during the last decade. We are just bringing the boat up to speed in the races and finding out how fast it is. 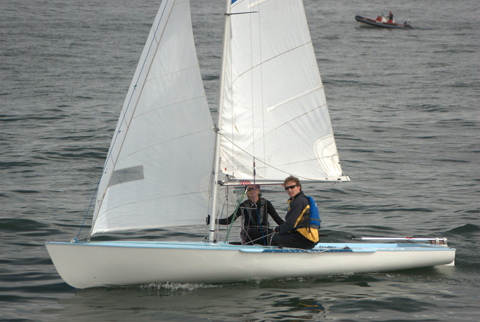 On the few races that we have lent it out to others in SF bay, it has been very competitive in light to medium air. It was raced by Paul Hemker in the 2005 North Americans. Bernardo Martinez says that it went very fast in the light air (of San Diego). The rigging was done by a former US Olympic FD competitor. This could be a boat to move into the “Grand Prix” boat (FD) category. It is easily a regional boat, possibly a National level boat, as yet it is unproven. This FD has had a major amount of time, money, and effort placed in it over the past year by the former owner. We have continued to improve this boat over the years. It looks and acts like a modern boat. It will need some work to make it look pretty, but it works well. . This FD will have a good trailer, good spars, good blades, adequate boat covers and regionally competitive sails. If you wish to include the best/new sails, blades, and spars, the price will increase appropriately. It was in the late 40's that the IYRU instigated a new modern 2-man international dinghy, the Tornado. She was not a success as there was no leap forward compared to the existing pre-war classes. The Royal Loosdrecht Yacht Club, Conrad Gulcher's club, obtained half a dozen Tornados and found them very uninspiring to say the least! Conrad had always been very interested in dinghy sailing and had collected any documentation connected with it. Pre-war he had enjoyed some international sailing in Germany and the UK and he had made many friends in the dinghy sailing scene. He imagined that with modern construction methods, molded ply, a better boat could be constructed. Being an Insurance Broker and not a designer he enlisted the help of Uus Van Essen, a naval architect and measures for the Dutch Yacht Federation. They made a preliminary design and early in September 1951 it was sent to 30 top class helmsmen in Europe including Bossom (Z), John Cahmier (K), Charles Curry (K), Manfried Curry (G), Ferry Laagwater (H),Stewart Morris (K), Morits Skaugen (N) and Shorty Trimingham (KZB), with the request to comment within two weeks. The measurements were similar to the 15m2 Wanderjolle of mid-European lakes and popular Flying Fifteen. By the end of September 23 responses had been returned with sufficient new and sound ideas to redesign the boat. Mr. Loeff, chairman of the CBC, was prepared to discuss the boat at the November meeting of the IYRU, only when he had seen her sail! This was hardly feasible but Conrad had the mould and hull built in one week and the boat finished in another! Complete with the Tornado rig it took to the water against the 12m2 Sharpie and Tornado at Loosdrecht one week before the IYRU meetings and Mr Loeff took the plans to the IYRU for discussion. Then it was decided to hold trials in the summer of 1952 in Holland and the name was born, suggested by Sir Peter Scott, the then president of the IYRU, the Flying Dutchman. The trials were held on the Loodrecht lakes and on the open water of the Zuiderzee at Muiden. 17 boats participated, some especially designed like the Osprey and Typhoon, and others were existing classes including Hornet, Caneton, Thistle, Sharpie, Rennjolle etc. The results were clear and the FD was adopted however with the limitation "for continental lakes only" and another set of trials was set up for 1953 at La Baule on the open sea. In the mean time the small jib was replaced with the Genoa and a trapeze was added. At La Baule there were again specially designed boats such as the Coronet, a smaller version of which later became the 505. Off the wind the Coronet with her bigger spinnaker and mainsail was faster (this is not just a recent problem!) but on the wind the FD won. It was clear that the FD did very well on the open sea and the "lakes" limitation was lifted. The Class started to blossom thanks to the promotional activities of Conrad through the Bulletin and a well structured Class Organization. In 1956 the FD participated (Conrad and Bob Boeschoten) in the cross-channel race from Folkestone to Boulogne and was the fastest two-man dinghy in the race! By the 60's there were fleets in all sorts of places such as the Lebanon, 25 in Morocco, 20 in Portuguese East Africa, Argentina, Venezuela, Thailand, apart from those in Europe, North America, South Africa, Australia and New Zealand. In 1957 the FD was selected to replace the Sharpie at the 1960 Olympic Games in Naples. In 1959 The Class President Slotty Dawes was presented a cup for the FD Week. The Week, with its unlimited number of boats allowed from each country, was very successful. The Week was very competitive whilst remaining friendly. Competitors lent each other sails! (no equipment limitation in those days!) and was well supported, in 1965 126 boats from 24 nations took part. The FD rules were tailored to have one design speed factors i.e. hull shape and weight, foil shapes and sails restricted and the rest left open to encourage development. As new ideas have evolved they have often been taken up by other classes e.g. trapeze, spinnaker chute, double floor construction, windows in sails and numerous developments in fittings and even personal sail numbers. The one design was guaranteed by the very simple, and consequently cheap and easily repeatable measurement system defined by Uss van Essen and born of his experiences as professional KNWV measurer. Many well known yachtsman have had a spell in the FD for example Buddy Melges, Dennis Conner, Ian Proctor, Mark Bethwaite, the Diesch pothers, Paul Elvestrom, Hans Foch, Ben Lexcen, Cam Lewis, Peder Lunde, Stewart Morris, Keith Musto, Andre Nelis, Yves and Marc Pajot, Rodney Pattison, Ralph Roberts, Bruno Trouble, Ted Turner, Mike Macnamara, John Loveday, Jo Richards, Roger Yeoman, Will Henderson, Peter White, Pat Blake, Jon Turner and David Wilkins to name but a few. Like many classes over the last few years there has been a decline in the active Flying Dutchman sailors but this has been reversed and the class is growing again and will remain the ultimate test of all the skills of dinghy sailing.